This graphic could look like a classical big infographic published on a spanish (or Southamerican) newspaper. Central illo, two big figures at the sides showing the two starrings, map and some details. Like many of the published by El Correo, ABC or El Mundo. The topic is also very hispanic: Moctezuma II, the aztec king. The important thing of this graphic is that it's published by the Daily Telegraph, made by Stefan Bailey and Ciaran Hughes. 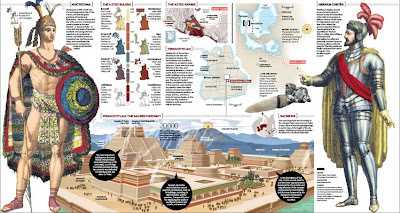 An english newspaper publishing spanish-fashioned infographics. Or not so spanish. Maybe remembering some great works of the englishman Peter Sullivan... They are returning to their bests moments, the moments we spanish used to build our bests ones. Michael Agar is head of graphics at the Telegraph group. He is renewing the infographics of the group since he arrived. English infographics are the cradle of the discipline, and they are rising again. This graphic could be seen by us (spanish and southamerican) as something already done, forgotten, but we also were fascinated by circle charts two years ago and it was already a classic in other countries. It's like they are walking fast again and doing all the way to be again one of the countries with the best inmediate future in infographics.